By now, you're probably noticing that I've got quite the Interactive Read Aloud blog series going. 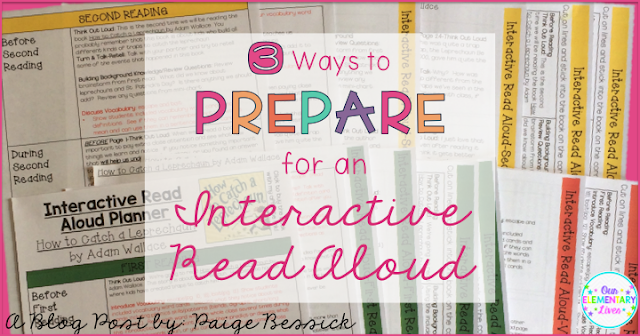 I'm showing you how I plan and prepare for Interactive Read Alouds. I believe they are one of the most important things we can do in our classroom and I want to make it easy for you to do them too. 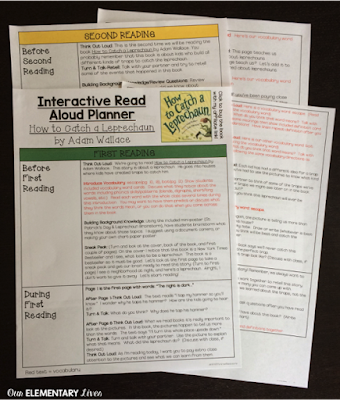 Read on for 3 ways that I have used to prepare for an Interactive Read Aloud. 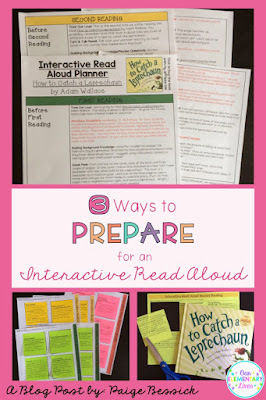 When I am preparing for an Interactive Read Aloud (IRA) I want to make it as easy as possible to actually execute it. So, I'm going to show you 3 ways you can do it. I'm sure there are many other ways to prepare, but these are my 3 favorite ways. 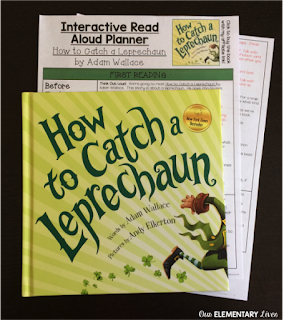 The simplest and easiest way to prepare for an Interactive Read Aloud is with the printed planner. This is just a planner you have prepared that you keep on your lap while your reading. While this is the easiest, I find this the hardest to use during an IRA. When you're in the middle of reading an awesome book with your class, it's hard to keep track of which page you're on, where you are on the planner and when to stop. So unless you know the book and your stopping points very well, this can be tricky to implement. Look how easy this is to prepare though. Just have your planner printed and go. My favorite way to prepare for an IRA is with sticky notes. Who doesn't love sticky notes, right? I buy the extra sticky ones (click HERE to see what I'm talking about and buy some) and print my thoughts and talking points on them. You can learn how to print on sticky notes from this blog post: How to Print On Sticky Notes in 3 Easy Steps! It's life changing, really. You're going to love it! So now that you know how to do that, you can print on sticky notes for your IRA. And this makes it super easy to prepare for an IRA. 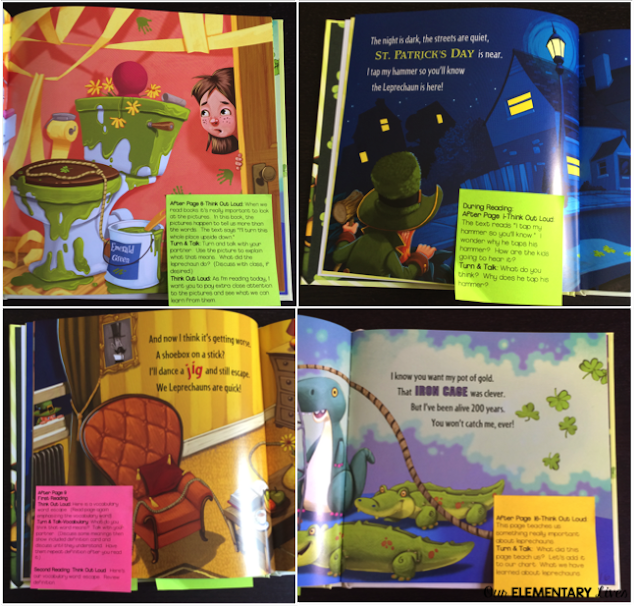 Here is an example of the sticky notes in the book. I love that I can just stick them on each page and be ready to go. When I get to that page as I'm reading, I take the sticky note off and hold it in my hand so it doesn't distract from the picture. Then I just put it back on the page and move onto the next page. When I'm done with that reading, I keep the template that I printed them on and just stick them back on the page and put them in my folder for this book. Easy peasy. You'll notice in several of the pictures that I have different color sticky notes. I like to color code them to make it easy to prepare for my IRA. My first read is one color (the neon green here), my second read is another color (yellow) and then vocabulary is another color (pink). For each read, I only put in the sticky notes I need. And for the vocabulary, I leave those in for all of the reads. The last way I'm going to show you is my newest way for preparing for an Interactive Read Aloud. I have my friend Matt, from Digital, Divide and Conquer to thank for this idea! Seriously, it's brilliant and I'm mad I hadn't thought of it sooner. Anyway, the part I love about sticky notes for my IRAs is that I can stick them in the book on the correct page. 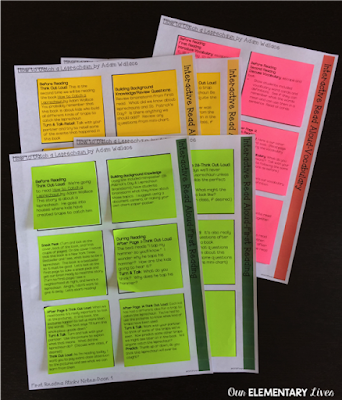 Well, sometimes I just don't have time to print on sticky notes so, this idea is genius! Just type the notes in a table, cut them out and then stick them in the page. They don't stay in as nicely as the sticky notes, but it is WAY faster. Look how easy it is to just cut and put them in the book at the right page. So there you have it! 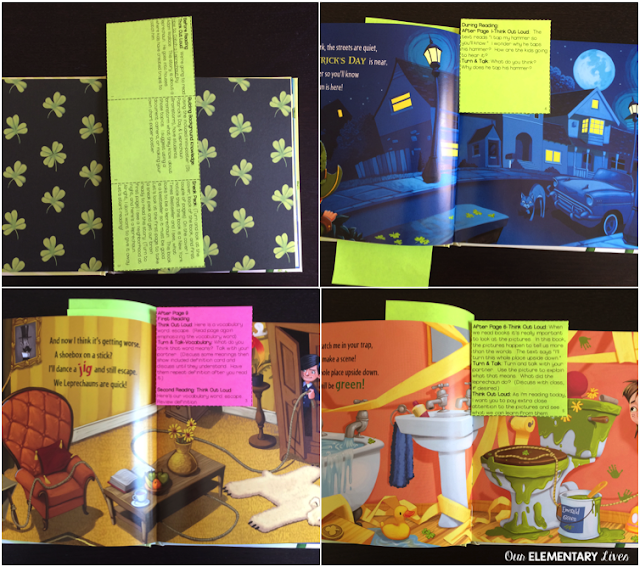 3 ways to prepare for an Interactive Read Aloud. 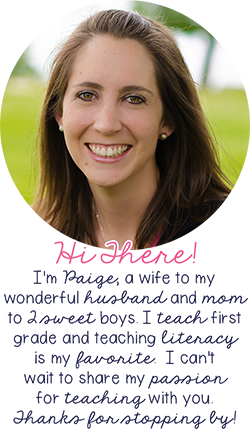 Now, if that sounds kind of daunting and you don't want to have to do that on your own for your books, you can click HERE to be taken to my Teachers pay Teachers store and see all of my Interactive Read Alouds. 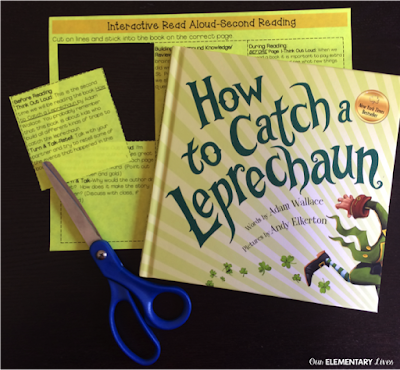 The one featured in this post is How to Catch a Leprechuan by Adam Wallace. 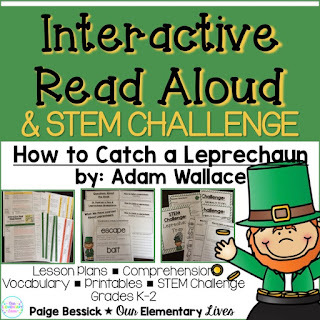 Click the picture to see that resource or click HERE to buy this adorable book, perfect for March and St. Patrick's Day. If you found this post helpful, please pin and share so others can read it too. 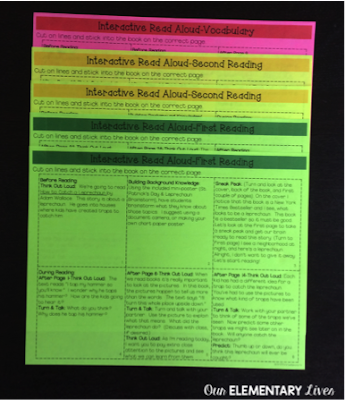 Again, I hope I've helped in making Interactive Read Alouds easy for you to implement in your classroom. I'd love your suggestions or comments on how you prepare for them. Leave me a comment below.